A strange man insists that his dog has learned to play poker. Teachìng the animal was a long process. First, Rover had to learn the suìts: hearts, diamonds, and so forth; then, the numbers and face cards. 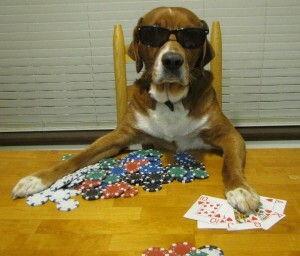 Finally and most diﬁcult, he had to learn the rules of poker. The man admìts that Rover is a bad player. When he has good cards he wags his tail.